Is Graviola the Next Cancer Cure? Home » Cancer » Can the Cure for Cancer be Found in Graviola Fruit? Can the Cure for Cancer be Found in Graviola Fruit? 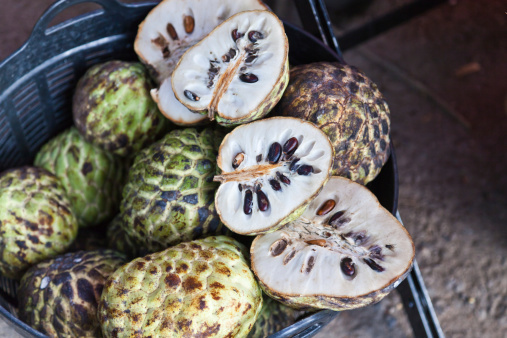 Graviola—aka soursop—is a deliciously exotic green fruit that hails primarily from the rainforests of the Caribbean islands, Mexico, and Central America. Its rich, citrus-like flavor makes it a popular ingredient in candies, smoothies, and even ice cream. The effects of graviola as a cancer treatment are still being investigated. According to the American Cancer Society, it is estimated that there will be approximately 1,658,370 new cancer cases this year. Although over one million of those cancer patients are expected to survive—there are still nearly 1,620 cancer deaths every day. A countless amount of money is being spent on treatments and finding the next cancer cure. But when conventional treatments don’t help, people often turn to alternative remedies. Let’s take a look at graviola—can the cure for cancer potentially come from an exotic evergreen tree? There is no permanent claim to this statement, obviously, but let’s take a further look. Does Graviola Have the Potential to Cure Cancer? Studies have shown that the graviola tree leaf may destroy cancer cells due to its active natural phytochemical, annonaceous acetogenins (this compound plays a key role in preventing cancer cells from producing energy). In Peru, graviola is often used in cancer-fighting procedures, while chemotherapy drugs are popular in the U.S.Since 1976, there have been approximately 20 independent in vitro laboratory tests where the graviola phytochemical was added to cancer cells in test tubes. These studies have discovered that the active acetogenins are effective in the treatment of cancerous cells in the pancreas, prostate, lung, colon, and breast. There are currently no double-blind human studies; however, the in vitro trials are still very promising.In a study published in the Journal of Natural Products in 1996, researchers at the Catholic University of South Korea found that the main graviola acetogenin, called annonacin, is 10,000 times stronger than the common chemotherapy drug, “Adriamycin.” The report also noted that the graviola compound could target colon cancer cells, while not touching the healthy cells. On the other hand, chemotherapy is known to target healthy cells as well as cancer cells—this can typically lead to hair loss and a host of other nasty side effects.Another 1996 study found that other graviola compounds could also beat out Adriamycin in the fight against cancer. Annopentocins A can kill pancreatic cancer cells, while annopentocins B and C have a similar effect on lung cancer cells. A mixture of the compounds cis-annomuricin-D-ones and trans-annomuricin-D-ones can destroy pancreatic, colon, and lung cancer cells.In a study published in the Journal of Medicinal Chemistry in 1997, researchers from Purdue University’s School of Pharmacy and Pharmaceutical Sciences in Indiana found that graviola leaves could kill cancer cells, including lung, prostate, and pancreatic cancers. It was discovered that the annonaceous acetogenins could also kill tumors previously resistant toward anti-cancer agents! Cancer cells that survive chemotherapy can develop a certain level of resistance, including resistance to chemotherapy drugs. This is called multi-drug resistance. Cancer cells will develop resistance to chemotherapy drugs from the creation of an “inter-cellular pump.” Basically, the cancer cells will push the anti-cancer agents out of the cell before they can be killed.The Purdue researchers found that the acetogenins eliminated multi-drug resistant (MDR) cancer cells by blocking the main source of cellular energy, ATP (adenosine triphosphate). A tumor cell requires energy to grow, and it also needs energy to protect itself and control the inter-cellular pump. Therefore, the acetogenins limit the energy toward the cancer cells, and the pump cannot run. Healthy cells typically do not need a pump, and ATP inhibitors will also not harm them. Got a leg cramp? Constipation? Catarrh or a urinary tract infection? Try consuming graviola to see if it can help prevent these ailments. Graviola can also potentially help build immunity and boost your energy. It may also help alleviate pain from rheumatism, arthritis, and back and joint problems. There are a few contraindications with graviola. It is not recommended in high doses for pregnant women. Like cancer cells, a fetus also produces high ATP levels, and the seeds and roots of graviola contain high concentrations of alkaloids, which can be neurotoxic. Graviola may potentially cause movement disorders similar to Parkinson’s disease, and it may also worsen Parkinson’s symptoms as well. It is best to avoid combining graviola with ATP-enhancers, such as coenzyme Q10 (CoQ10) as graviola can potentially cause sedation and sleepiness at times. Long-term use of graviola may also kill the good bacteria in the digestive tract. It is advised to supplement the diet with digestive enzymes and probiotics when graviola is used for longer than a month. Graviola fruit, bark, and root can all be used medicinally; however, it is best to use the leaves for optimal graviola benefits. The leaves are known to contain the highest concentration of acetogenin. Graviola supplements are often found in health food stores, and sold as tinctures, powders, tablets, and capsules. Try adding two to three grams of graviola to your herbal tea, three to four times daily. In tablets or capsules, the reported therapeutic dosage is two grams, three times daily. The standard tincture dosage is two to four milligrams, three times a day. Of course, for the most appropriate graviola dosage, it is best to consult an herbalist or a healthcare professional. “Cancer Facts & Figures 2015,” American Cancer Society web site; http://www.cancer.org/research/cancerfactsstatistics/cancerfactsfigures2015/index. Zeng, L., et al., “Five new monotetrahydrofuran ring acetogenins from the leaves of Annona muricata,” Journal of Natural Products, November 1996; 59(11): 1,035-1,042. Rieser M.J., et al., “Five novel mono-tetrahydrofuran ring acetogenins from the seeds of Annona muricata,” Journal of Natural Products, February 1996; 59(2): 100-108. Oberlies, N.H., et al., “Structure-activity relationships of diverse Annonaceous acetogenins against multidrug resistant human mammary adenocarcinoma (MCF-7/Adr) cells,” Journal of Medicinal Chemistry, June 20, 1997; 40(13): 2,102-2,106. “Graviola (Annona muricata),” Tropical Plant Database web site; http://www.rain-tree.com/graviola.htm#.VTbQHGa-1FV. “Can graviola (soursop) cure cancer?” Cancer Research UK web site; http://www.cancerresearchuk.org/about-cancer/cancers-in-general/cancer-questions/can-graviola-cure-cancer. Sarich, C., “Tropical Fruit Destroys Cancer Cells With ‘Lethal Precision,’” Daily Health Post web site, March 19, 2014; http://dailyhealthpost.com/tropical-fruit-destroys-cancer-cells-with-lethal-precision/. “Soursop Reviewed: Cancer Cure,” Soursop Reviewed web site; http://soursop-cancer.com/. Lane, C., “Fighting Cancer with Science and Nature,” Psychology Today web site, July 10, 2011; https://www.psychologytoday.com/blog/side-effects/201107/fighting-cancer-science-and-nature. “Soursop,” Purdue University: Center for New Crops & Plants Products web site; https://www.hort.purdue.edu/newcrop/morton/soursop.html.